The James Craig and Irene Scala Designing with Type Award provides a stipend for one School of Art students with a strong interest in design, who will study abroad in the Fall or Spring semester of the next academic year. The stipend provides $5,000 to help cover travel and living expenses while enrolled in a school outside the United States that has a formal exchange agreement with the School of Art. Click here to see a list of approved schools. Applicants must be in good academic standing and will be required to submit to the Dean of the School of Art the name of the exchange institution, work samples, travel plans, and a statement of what they hope to gain through study abroad to be considered for the award. Awards will be determined by the Dean of the School of Art in consultation with the Selection Committee. Upon their return, award recipients will submit a report to the Dean, which will be shared with the donors. Applications for the Fall 2014 semester are now being accepted. Deadline for applications will be announced soon. 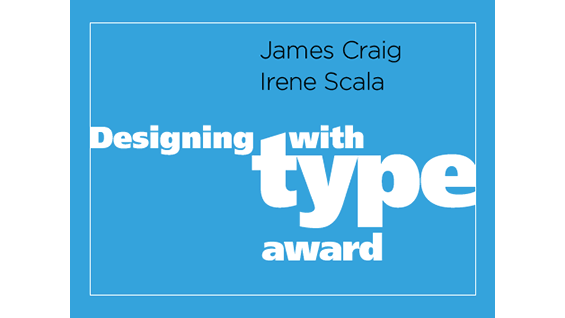 Please complete and sign the James Craig and Irene Scala Designing with Type Award application form, attach the required typed essay of no more than 500 words, and a digital portfolio with supporting materials and submit it to the Dean of the School of Art. Applicants will be notified in writing and those selected must, in turn, agree in writing to participate. Pursuant to the requirements of the Privacy Act of 1974 (P.L. 93-597) please be advised: Public Law 99-661 authorizes solicitation of the information that will be used to select the James Craig and Irene Scala Designing with Type Award recipients. The information may also be used to publicize student selection as a James Craig and Irene Scala Designing with Type Award recipient. Furnishing the information is voluntary; however, failure to do so will prevent selection as a James Craig and Irene Scala Designing with Type Award recipient.